From the start of 2012 the spotlight on Iran and for good reason. Today the entire region is now on tenterhooks for the next move, with US, Iranian and Gulf armies on the highest war alert. Earlier the main scenario was that Israel would make an preventive limited air strike to Iran’s nuclear facilities, now it seems that U.S is going to war with Iran. The decision point for applying a military option, before too late, is getting nearer. Ehud Barak, Israel’s minister of defense, implied that this critical point would be reached in less than a year, in a recent CNN interview. U.S has changed radically its earlier position, now both the U.S. and Israel say also officially that they have not ruled out military action against Iran. This in case if diplomacy fails to resolve a dispute over the nuclear program, which Tehran says is peaceful but the West believes is a cover for trying to build atomic bombs. The use of military option is now well on the way. Thousands of US troops began descending on Israel this week as part of the US-IDF deployment in readiness for a military engagement with Iran and its possible escalation into a regional conflict. The 9,000 US servicemen gathering in Israel in the coming weeks are mostly airmen, missile interceptor teams, marines, seamen, technicians and intelligence officers. Officially this maneuver is part in sc Austere Challenge 12, the biggest joint US-Israeli war game ever held. The joint US-Israeli drill will test multiple Israeli and US air defense systems against incoming missiles and rockets, according to the official communique; they will also practice intercepting missiles and rockets coming in from Syria, Hizbollah in Lebanon and Hamas in the Gaza Strip. In fact the joint force will now be in place ready for a decision to attack Iran’s nuclear installations or any war emergency. Washington and Jerusalem are doing their utmost to present a perfectly synchronized military front against Iran: American officers are stationed at IDF command centers and Israeli officers posted at the US European Command-EUCOM. British Defense Minister Phillip Hammond, on a visit to Washington, affirmed unofficially that Britain stands ready to strike Iran if the Strait of Hormuz is closed. Officially this was not said as the Obama administration tries keep a low profile on plans for attacking Iran. Tehran is staging military’s maneuvers every few days to assuring the Iranian people that its leaders are fully prepared to defend the country against an American or Israeli strike on its national nuclear program. By this strategy, Iran’s ground, sea and air forces are maintained constantly at top war readiness to thwart any surprise attack. The next Iranian naval exercise at the Strait of Hormuz to take place in February, although its 10-day drill in the same arena only ended Monday, 2. Jan. 2012. Iranian marine commandos were preparing to sow mines in the strategic Strait of Hormuz. Other – last week tested – possibility was using Shahab-3 ballistic missiles which have a range of 1,600 kilometers and other missiles, such as the Nasr1 cruise marine missile, are capable of reaching Hormuz from central Iran. Tehran has also redistributed the Shahab missiles to secret sites ready to launch retaliatory strikes. Iran itself has reported that the new Fordow nuclear enrichment plant will be operational in the near future to refine uranium to a fissile purity of 20% – far more than the 3.5% level usually required to power nuclear energy plants. 20 % uranium can be turned more easily into fissile warhead material. Based to information of the International Atomic Energy Agency inspection 348 machines are operating at Fordow. Operations at the bunker-like Fordow facility south of Tehran are small in comparison to Iran’s main enrichment site in Natanz in central Iran, where nearly 8,000 centrifuges are operating. The centrifuges at the underground labs are considered more efficient than others and are shielded from aerial surveillance and protected against airstrikes by up to 300 feet (90 meters) of mountain rock. Iran has also announced that it had succeeded in producing and testing its own uranium fuel rods for use in its nuclear power plants. If true, this claim would constitute a significant advance in Iran’s efforts to attain the capability of powering its nuclear reactors without international assistance. The starting point with today’s tensions could be the interview in a CBS Tuesday, Dec. 20 where US Secretary of Defense Leon Panetta said following: “Despite the efforts to disrupt the Iranian nuclear program, they have reached a point where they can assemble a bomb in a year or potentially less”. This is a radical change in US administration policy. “That’s a red line for us and that’s a red line, obviously, for the Israelis,” Panetta noted. Instead of warning Israel against striking Iran, he said: “If we have to do it we will deal with it.”A nuclear weapon in Iran is unacceptable”. From Tehran’s standpoint, the American military departure from Iraq has removed a formidable obstacle in Israel’s path to an attack on its nuclear installations: the shield of the US Air Force’s control of Iraqi skies. Covert activities against Iran have included the use of computer worms to attack Iran’s nuclear installations, including the Stuxnet virus that in 2010 was thought to have destroyed more than a thousand of Iran’s uranium-enriching centrifuges by causing them to spin out of control. Several Iranian nuclear scientists have been assassinated, and in November explosions ripped through the Islamic Revolutionary Guard Corps’ ballistic missile base near Tehran. Seventeen people were killed, including one of the IRGC’s top officers in the missile development program. The covert activity is designed to slow Iran’s nuclear progress but they are not stopping Iran’s enrichment activity permanently. Iran is thought to have many more nuclear scientists and missile designers than Western intelligence services could ever eliminate. In October, the Obama administration accused Iran of plotting to assassinate the Saudi ambassador to Washington, an alleged plot that some Iran analysts see as an Iranian effort to hit back. The storming of Britain’s Embassy in Tehran in late November and a December explosion outside Britain’s Embassy in Bahrain may be other signals of Iran’s intention to respond to covert fire. According to reports in Haaretz and Ynetnews 29.12.11, Israel and the United States have recently been discussing ‘red lines’ which would necessitate a military strike on Iran’s nuclear facilities. US administration is keen to avoid Israel surprising the US by taking unexpected military action against Iran in the coming year. Scenarios, in which Washington might find a military strike against Iranian nuclear facilities necessary, include e.g. if Iran were to expel IAEA observers, if it were to enrich uranium to weapons grade, and if it were to install advanced centrifuges in its newly constructed underground uranium enrichment facility in Qom or Iran making progress on new secret enrichment facilities. The U.S. Air Force has unveiled the Massive Ordnance Penetrator – dubbed the Big Blu – and speculation is already mounting that it may be used in airstrikes on Iran (as well on North Korea if needed). 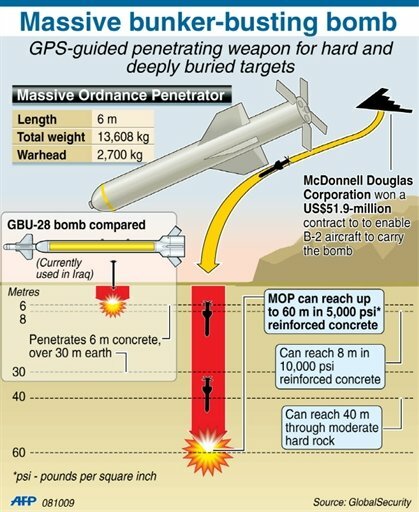 B-2 Stealth Bombers will use the six metre long GPS guided rocket, fitted with 2.5 tons of explosives, to smash open underground bunkers and tunnels suspected of containing weapons of mass destruction. To be a successful military strike, Iran must be deterred and prevented from rebuilding its programme. Is this possible is the question and will define the scope of attack. In response to mounting Western pressure over its nuclear ambitions, Iran started a naval drill in the Gulf last week , responded with belligerent rhetoric, spooking oil markets by warning that it could shut the Strait of Hormuz if sanctions were imposed on its oil exports, the country’s main revenue source. However if Hormuz will be closed by mines, the U.S using mine countermeasures can reopen Hormuz within 24-48 hours. The Strait of Hormuz is one of the world’s most important waterways. Some 40% of all seaborne oil passes through this narrow passageway, which is equivalent to about 20% of total oil traded worldwide. This amounts to 16.5 to 17 million barrels per day (other significant choke-points for the transit of oil include the Suez Canal – 4.5 million barrels per day and the Strait of Malacca – 15 million barrels per day). Israel has no influence over internal events in Syria or Lebanon. Its interest is in a quiet northern border. For as long as Hezbollah is able to maintain its independent military infrastructure in Lebanon, the threat of an attack on Israel remains. Hezbollah has extensively rearmed after the losses it incurred in the 2006 Second Lebanon War. It is now estimated to have an arsenal of 40,000 rockets, including precision guided missiles that can reach all parts of Israel. It has also deliberately deployed its weapons in villages to make them harder for Israel to target in any future conflict due civilian/collateral damages which would damage Israel’s image even more if possible. On 7 July, Israel Defense Forces revealed, in unprecedented detail, previously classified information about Hezbollah’s deployment in south Lebanon. The information released focused on El Khiam, a Shia town in south east Lebanon a few miles from the border with Israel. El Khiam was the scene of fighting during the 2006 war; the surrounding area was used by Hezbollah to launch Katyusha rockets at Israel. The IDF material included maps and a 3D simulated video of the village, showing that weaponry and rockets were being stored close to schools, hospitals and residential buildings. A military strike can have serious strategic consequences too. Iran will surely respond violently, both directly and through proxies such as Hezbollah. Iran has long-range missile systems including the Shahab-3, which could reach Israel and U.S. bases in the Middle East. The conflict could escalate into a regional war. 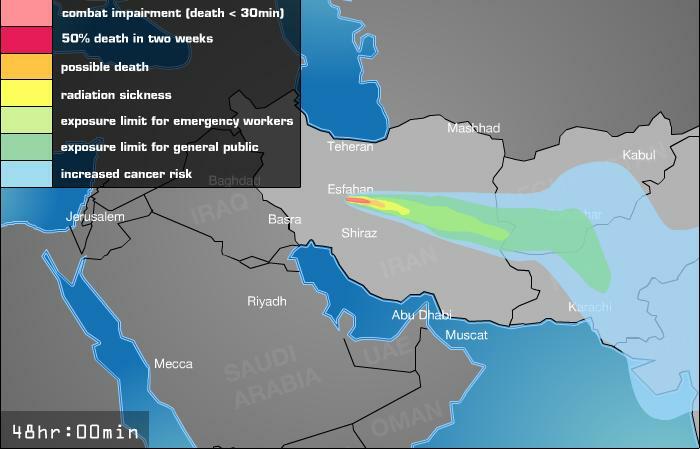 Iran may take aggressive action in the straits of Hormuz, leading to a spike in oil prices, even though disrupting the flow of oil would be self-defeating. War games are a puzzle not only with tactical alternatives, timing, more or less accurate intelligence and means available but also with known and un-known risks. One event on 4th Dec 2011 brought one new piece to this puzzle. On Dec 8th 2011 Iran exhibited the top-secret US stealth drone RQ-170 Sentinel captured on Sunday, Dec. 4. Its almost perfect condition confirmed Tehran’s claim that the UAV was downed by a cyber attack, meaning it was not shot down but brought in undamaged by an electronic warfare ambush. This is a major debacle for the stealth technology the US uses in its warplanes and the drone technology developed by the US and Israel. The state of the lost UAV refutes the US military contention that the Sentinel’s systems malfunctioned. If this had happened, it would have crashed and either been wrecked or damaged. The condition of the RQ-170 intact obliges the US and Israel to make major changes in plans for a potential strike against Iran’s nuclear program. Air strike would not eliminate the knowledge about how to build a nuclear weapon that Iran already has. Bombing would pass those nuclear sites that foreign intelligence services do not know about. Israel might have best available missile defense. However the capacity can not absorb 40.000 missiles by Hizbollah in short period of time and some % will cause serious damage. The newest Iranian nuclear facilities are nearly 100 meter deep in hard rock. 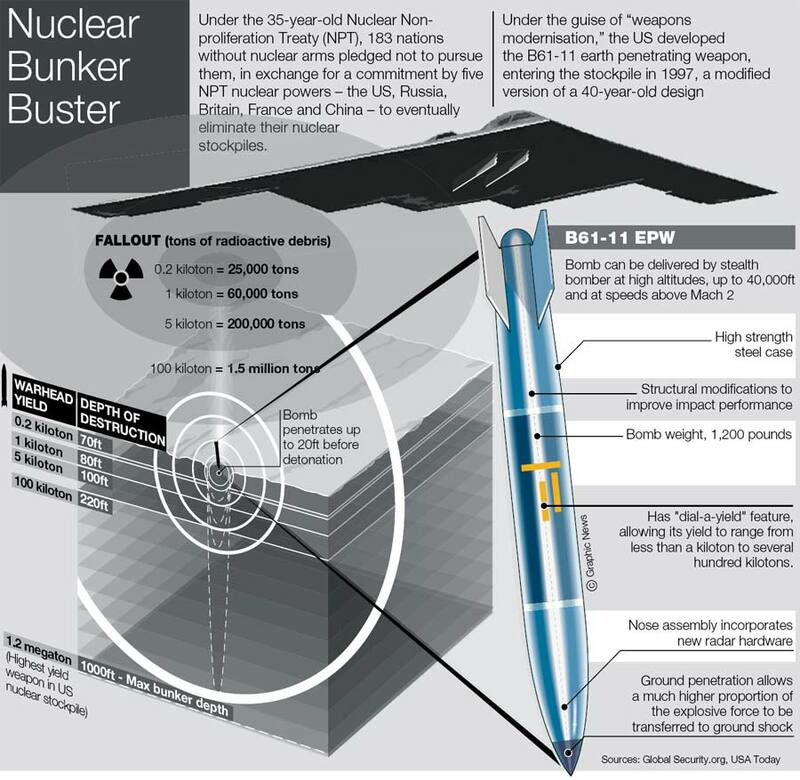 The consequence is that to destroy this plant the most effective bunker busters are needed maybe even a nuclear bomb some 1 megaton size. Using so heavy methods can have their effect also outside Iran’s borders e.g in form of radioactive dust. Israel is unique in that it perceives a nuclear Iran as a potentially existential threat. The Iranian leadership has continuously threatened to “wipe Israel off the map” and with nuclear weapons they could also implement this aim. Given their collective memory of the Holocaust and the hostile surrounding in which they have had to defend themselves, Israelis take this threat especially seriously. A nuclear Iran would change radically regional or even geopolitical balance. It would increase the danger of miscalculation towards a nuclear crisis. Iran could take bolder position threatening Israel and moderate Arab regimes, undermining any Israeli-Arab peace process and manipulating the energy markets. Dore Gold hits the core of the problem in his column published in IsraelHayom by asking Is Iran rational? One of the most difficult questions that the West needs to answer in the year ahead is whether Iranian behavior will be influenced mostly by rational considerations or by ideological beliefs. Some analysts say that the possession of nuclear weapons might encourage moderation in the Iranian regime ( Reuven Pedatzur in Haaretz on Dec. 20, 2011). The leading commentator on international affairs in the U.S., Fareed Zakaria, also believes that a nuclear Iran would act rationally and could be deterred. He notes that the Revolutionary Guard has become the center of power in Iranian decision-making taking, displacing the religious leadership. Western intelligence has assessed that if Iran wanted to develop atomic bombs, it has the scientific, technical and industrial capacity eventually to do so. There might be not yet a consensus in Tehran that they actually want build a bomb, it is seen more like an open option for the future. So far the aim of in fact covert war has been to give Iran’s leaders a reason not to go nuclear weapons. However Iran might see this current policy opposite way, it could give Iran a reason to weaponise. So far the aim of in fact covert war has been to give Iran’s leaders a reason not to go nuclear weapons. However Iran might see this current policy opposite way, it could give Iran a reason to weaponise. The registration of candidates for the Majles elections slated for March 2, 2012 ended last weekend. Meanwhile, power struggles are still being waged between the two major bodies affiliated with the conservative bloc: the United Conservative Front, affiliated with President Ahmadinejad’s political opponents, and the Stability Front of the Islamic Revolution (Jebhe-ye Paydari), which consists of activists considered to be the president’s allies. The Khabar Online website reported this week that from among more than 1,000 candidates who registered for the elections in Tehran Province, only about 60 are well-known political personalities; and that 46% of the candidates are affiliated with the United Conservative Front, 21% with the Stability Front, and 7% with the reformist camp. Will there be anything else than negative and more negative outcomes? An alternative way to military option from my point of view – which might be too optimistic – is to boost of diplomacy and sanctions. After years of measures that had little impact, the new sanctions are the first that could have a serious effect on Iran’s oil trade, which is 60 percent of its economy. Sanctions signed into law by U.S. President Barack Obama on New Year’s Eve would cut financial institutions that work with Iran’s central bank off from the U.S. financial system, blocking the main path for Iran to receive payments for its crude. Following the announcement by the European Union that its member states will cease imports of Iranian crude oil, Japan said yesterday that it would also consider cutbacks in its purchases of Iranian oil. Also China has cut its purchases of Iranian oil by half this month, and is set to extend its cuts into February. The EU, China and Japan account for about half of the totality of Iranian exports of 2.6 billion barrels of oil per day. These new sanctions will have some economic effect in Iran but other sanctions might be needed. Diplomacy must be done with various interests in mind. Iran has recently signaled that it is willing to restart talks with UN lead international community based 5+1 composition (=UNSC+Germany). The hope is that Iran will come around and allow IAEA inspectors to resume inspections. However, there always exists the possibility that Iran may use IAEA inspections as a way to buy time at sites unknown to the IAEA. If sanctions and diplomacy fail and proof of a nuclear weapons program is established, should the military option be seriously considered. If all non-military pressures fail there are clearly no “good” options available. In my opinion it is hard to believe either side wants a war to start because all sides are aware about risks. Today’s preparations for strike might be aimed to be means of pressure to get non-military solution. However, when emotions are high, domestic political interests differ in different key player states and massive destruction weaponery is on the theatre the situation can escalate anytime. You are currently browsing the Conflicts by Ari Rusila blog archives for January, 2012.